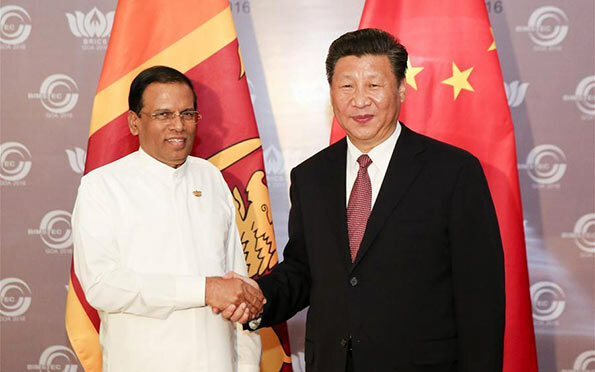 Chinese President Xi Jinping met with Sri Lankan President Maithripala Sirisena on Sunday, vowing to deepen bilateral pragmatic cooperation within the Belt and Road framework. The two leaders met on the sidelines of the eighth BRICS summit in the western Indian state of Goa. China-Sri Lanka relations have seen positive and healthy development momentum, said Xi, noting that China will work with Sri Lanka to carry forward the traditional friendship cultivated by generations. Next year marks the 60th anniversary of the establishment of diplomatic ties as well as the 65th anniversary of the signing of the Agreement on Rice for Rubber, he said, calling on the two sides to take the opportunity to cement traditional friendship and deepen mutually beneficial cooperation, so as to lift bilateral ties to a new high. In 1952, Sri Lanka withstood the pressure from the United States and other Western countries and signed the famous rice and rubber agreement with new China, and in doing so, opening a chapter in the history of friendly exchanges between the two countries. To further their relations, Xi suggested the two sides maintain high-level contacts and political communication, and continue to show mutual support on issues concerning each other’s core interests. China appreciates Sri Lanka’s support for and active participation in the Belt and Road construction, said Xi. He called on the two sides to deepen cooperation in the sectors of trade, port operation, infrastructure construction, port-vicinity industrial parks, production capacity and people’s livelihood. He said the two sides should continue to advance their mega cooperative projects such as the Colombo Port City and Hambantota Port. Xi voiced hope that the two sides will make good preparations for the activities celebrating the 60th anniversary of the establishment of diplomatic ties and encourage more exchanges among all sectors of society, including local affairs, Buddhist community, youth, think-tanks and media. The Chinese president also suggested the two sides expand cooperation in the fields of tourism, ocean, security and disaster preparedness and mitigation. He said the two countries should enhance coordination within multi-lateral frameworks and continue to support each other in international and regional affairs. For his part, Sirisena said the time-tested relations between the two countries have gained a stronger momentum under the new situation. He thanked China’s assistance for Sri Lanka’s development as well as China’s support to his country on the international arena. Sri Lanka adheres to the one-China policy and is willing to strengthen coordination and communication with China in international and regional affairs, he added. Sirisena said Sri Lanka is willing to speed up the implementation of relevant economic and trade agreements with China as well as cooperation on maga projects. He welcomed Chinese enterprises to increase investment in Sri Lanka. Sri Lanka is a member of the Bay of Bengal Initiative for Multi-Sectoral Technical and Economic Cooperation (BIMSTEC), a regional mechanism that is aimed at connecting South Asian and Southeast Asian countries and also groups Bangladesh, Bhutan, India, Myanmar, Nepal and Thailand. On the margins of the BRICS summit in Goa, Xi and other BRICS leaders held dialogues with the BIMSTEC leaders and representatives.